Welcome back to ultimate’s live storytelling series. It brings together the best storytellers and their local communities for unforgettable nights. Stories are a vital part of the deep personal connections that make up the sport and culture of ultimate. The stories you tell on the ride back from a tournament have a home – it’s Flatball Radio. Tickets to the Portland show on Monday, May 11th can be purchased here. All of the stories from the Portland show will be filmed and released on Skyd Magazine in June. It will be six months before I’m able to say it out loud, but in that moment I know – it’s over. A hazy walk lands me behind a shed, yielding privacy from a sideline filled with my best friends. With complete resignation, I put my head between my knees and start to cry. More accurately, I’m weeping, alone in another country, and I’m acutely aware that I have lost the biggest part of my identity. The last day I put on cleats and stepped on an ultimate field was June 3rd, 2012. I didn’t wake up that morning knowing it was the final time I would play my favorite sport, but life rarely affords you the luxury of foresight. 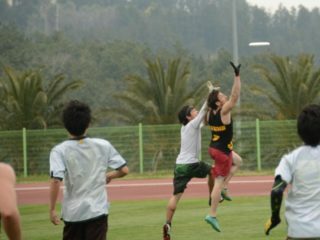 Early in my playing career, I daydreamed about how long I would play ultimate and how I would leave the game. I don’t recall that any of those daydreams included my final game being at a preseason tournament in Canada. Certainly, none of them included two brain injuries in the span of 14 months. This was the first time I had to part ways with such a huge part of my identity. Luckily, it wasn’t too much longer before I realized a personal dream and found a career path. I completed my first feature length film, “Chasing Sarasota,” and toured it in theaters around the world. Six months after the last “Chasing Sarasota” show, I saw Tyler Kinley speak at a RISE UP conference in Amsterdam. Tyler told a story in a way that connected on an honest, deeply human level. From then on, I knew that I wanted find a way to share the strong and diverse perspectives of the ultimate community. Months of hard work and collaboration with pTyler came together in a project we called Flatball Radio. We planned for it to be an outlet not just for our stories, but for all ultimate stories. Held in Seattle in December 2013, the first Flatball Radio was a special experience. It was the first time since hanging up my cleats that I truly felt like I was a part of a team again. It connected me with people in the ultimate community in a new and exciting way. After losing my ability to be on the field, this was medicine. The seven storytellers blew me away with their emotional insights, life experiences and willingness to tell their stories. There was a profound connection between our storytellers and the audience during our premiere event in Seattle, and I’m indebted to everyone involved for taking a risk on a new project. Following the Flatball Radio premiere, I took a step back to evaluate what came next. Over the span of three years, my career was consumed by ultimate related projects,having created “Chasing Sarasota,” “The Herd” and Flatball Radio in quick succession. I decided to briefly take a step back, and to seek validation outside of our world and create for a different audience. Stepping out of the sandbox, I found some success in filmmaking and video production. The success got me excited. The success gave me confidence. It’s with this excitement and confidence, and a love for both storytelling and ultimate that I’m proud to announce, Flatball Radio is back! I have been hard at work re-tooling this project and working with some exceptional partners. Though I’m not obligated to talk about them, I am grateful to give credit to Flatball Radio’s two best friends – Five Ultimate and Skyd Magazine. It’s not pandering to say that the only reason this project is seeing the light of day again is because of them. The ultimate community is good at working really hard for little in return. I am beyond lucky to have a presenting sponsor like Five Ultimate who lightens that load and makes the process super fun. I can’t wait to explore a new partnership with Skyd Magazine and get these exceptional stories out to more people. Their creative partnership is already pushing the project in new directions. The next live show is on Monday, May 11th in Portland, Oregon at The Secret Society. Tickets on sale now! Every story told live on stage will now be available for FREE online via Skyd Magazine. Be on the look out for these in June! Andrew Schwartz | Pacific Lutheran alum who stumbled onto the New York Empire. Huffington Post writer and master wordsmith. Chase Sparling-Beckley | Team USA player and coach. World, Club, College, High School and Mixed Champion. Best huddle speeches in the business. One of the all time greats. Chelsea Putnam | Team USA player and coach. Has played ultimate in Portland forever. Makes the energizer bunny look lazy. Dan Shaw | Portland Stags and elite Mixed player. Known by everyone in Portland. Loved by everyone in Portland. Delia Chiu | Stanford alum and Schwa anchor. 20 year veteran. Blends New York honesty with Portland charm. Kelly Hansen | Fugue/Natural 20s/Schwa player. On stage since birth. Lives for the audience. Rick Huddle | 14-year Portland Mixed player. Storyteller by profession. Has spoken on the Moth, writes one man shows and is a pirate singer. Flatball Radio has a podcast! These are new, hour long conversations with the most compelling people in ultimate. I want to learn about their journey in ultimate and have them share some of their most memorable stories on and off the field. These episodes will be debuting in June. All seven stories from the World Premiere in Seattle will be released for free on Skyd’s YouTube channel. Plus, there will be one never seen before clip of Ben Wiggins, Dom Fontenette and Tyler Kinley talking about their most embarrassing moments on the ultimate field! Grab a seat in the stretching circle, because Flatball Radio 2.0 is coming in 2015!